Attorney General K. K. Venugopal arguing for the state will conclude his arguments followed by Shyam Divan who commences his rejoinder for the Petitioners. Aadhaar hearing will begin shortly. State will conclude it’s arguments today. Attorney General K.K Venugopal commences his submissions. Repeats that Article 110(1)(g) is a standalone provision. There can be a bill that does not relate to 110(1)(a)-(g) but is still covered independently under 110(1)(g). Therefore the Aadhaar bill did not have to to be passed by the Rajya Sabha. RS could only make recommendations. Chief Justice of India: Section 57 is an enabling provision that allows state legislature to introduce Aadhaar for various services. The state legislature may or may not introduce it as a money bill. It’s nature will then be examined if it’s challenged in a court of law. Attorney General cites Articles 122 (Courts not to inquire into proceedings of the Parliament) and 255 of the Constitution in support of his money bill argument. Cites and is reading out the case of Mohd. Saeed Siddiqui v. State of Uttar Pradesh. Next, he’s reading from Yogendra Kumar Jaiswal v. State of Bihar. Now wants to talk about Aadhaar telecom linking. Reading Lokniti order and the Bench’s recital of the Union government affidavit in that order. Says currently Aadhaar is not mandatory to obtain a new connection ,but there will be no chance of forgery and fraud if Aadhaar is linked to SIM card. Says Aadhaar was made optional as per the direction of the Supreme Court (SC had denied a few days ago that it had issued any direction to make Aadhaar mandatory for sim in the lokniti case), but it will only remain optional till the final disposal of the matter. Justice DY Chandrachud asks how the linking is relatable to Section 7. Justice Sikri points out that petitioners wanted something and Govt agreed. Where is the question of a direction, he asks. Says they are recognizing the interim order passed in the lokniti foundation case, and hence making Aadhaar optional for the time being. Chief Justice of India and Justice Sikri don’t appear to agree. A-G then moves to the next argument. surveillance is prohibited and Court cannot proceed on the basis that a violation will take place and surveillance is possible. Reiterates that no core biometrics data is shared under the Aadhaar Act. Reads out the offences and penalties laid down under the Aadhaar Act. On the point of surveillance, says we cannot accuse a democratic govt of such conspiracy. Concludes by stating that the state takes offense to the fact that words such as “electronic leash”, “totalitarian state” and “concentration camps” were used. Bench rises for lunch. Rejoinder will begin post lunch. Shyam Divan to commence for the Petitioners. The Supreme Court is at the vanguard of balancing complex issues of technology and rights. The Supreme Court will lay down the law for generations. The Attorney General concluded the case by talking about surveillance. So let me begin by talking about surveillance. After I ended my arguments, on the 9th of March, the Union filed an affidavit on 9th March. In that affidavit, the Union has appended an expert report by Mr Manindra Agarwal from IIT. CEO talked glowingly about him, a Godel prize winner. This report is dated 4th of March. Also, the CEO of UIDAI filed supporting documents. On identity and date and time, both sides agree that it is tracked. The disagreement is on the question of location. 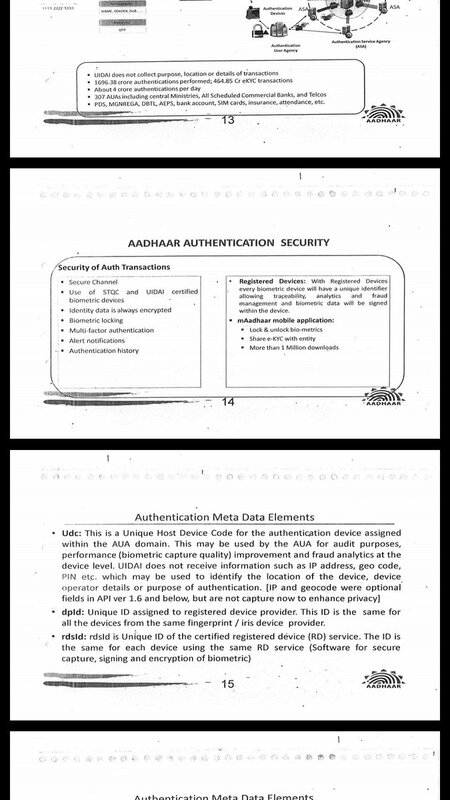 Takes out the UIDAI CEO’s power point presentation, and goes to pages 21 and 22. Points to the name of Manindra Agarwal on the technology and architecture board as well as the security committee of Aadhaar. Says that this gentleman is therefore clearly very well versed in the ecology of Aadhaar. Goes to the expert report, dated 4th March 2018. The Report says that the biometric database is accessible to third party vendors such as Morpho, L1, Accenture etc. This has now been expressly conceded. Read the report here. 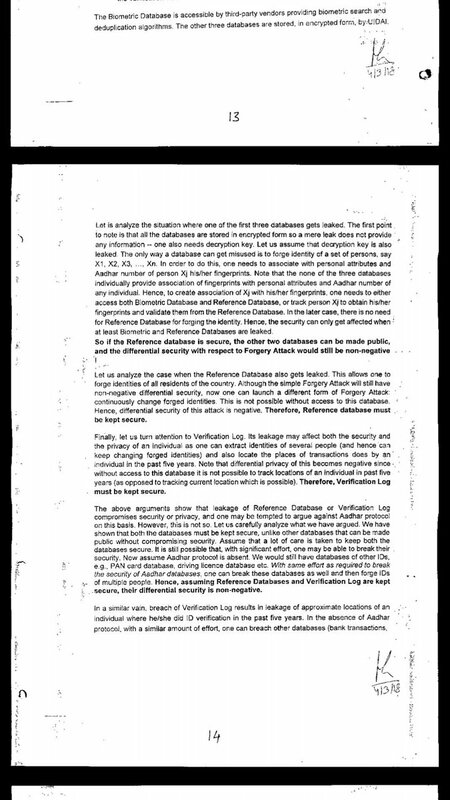 Now goes to page 14 of the Report, which is about the verification log, and says that leakage of the verification log can lead to forged identities and revealing of location. It also says that breach of verification log results in leakage of location data – that is, location of the places where the transactions were carried out. There is an express admission that tracking of current location is also possible. This indicates that location is indeed ascertainable from the verification log, and UIDAI has access to it. Justice Chandrachud asks Shyam Divan to read the previous para. The previous para says that the databases must be kept secure, and that other databases can be broken with the same effort. Shyam Divan: The takeaways are that from the verification logs, you can trace location. Secondly, even without the verification logs, current location can be tracked. Thirdly, UIDAI knows the location. A third party, to know it, they will have to breach the log. And fourthly, breach of of the log will yield approximate location over five years. I did not have the advantage of the report when I argued. But I will address it now. The Report admits the inconvenient truth, and the Union of India has very honourably placed it before the Court. So you now have three experts (Kelekar, Dsouza, Agrawal and Pandey) on both sides who agree that real time location tracking is possible, and there are verification logs for five years. It is now for the Court to decide if this is constitutionally permitted. Justice Chandrachud says that the report only says that you can’t have perfect security. And the report says that there is a loss of privacy in the digital world, but Aadhaar isn’t responsible for that. Shyam Divan says that there are two separate issues. The first is a limited government issue. It deals with the coercive power of the State. Our case is that there cannot be a system that is designed to track location in real time. The coercive power of the State does not extend that far. Says that it’s not as if darkness will descend immediately if the program is allowed. The issue is that if you have this kind of location tracked across a person’s lifetime, it creates a chilling effect in its classical sense. This is not about sophisticated commercial surveillance through big data. This is much more basic – name, date and time, location, for everyone and all the time. Now comes to UIDAI CEO’s power point presentation. The presentation says that every registered biometric device will have traceability. This is to prevent fraud. But what it means is that you have an electronic trail, that goes back to each device. Reminds the Court of the screenshots of the Kerala Dairy Board, that was tracking location. Says that this is one among tens of thousands of entities who will have access to such databases. There are proliferating database with these details. This is not about the CIDR, but at the levels of the AUA and ASA. Over a lifetime, imagine the chilling effect this has on people’s conduct. On 25th April 2018 at 12 37 PM, Mr Dwivedi made the argument that the UIDAI and the CIDR is separate and autonomous, so unless there is collusion, you won’t have surveillance. But that’s not the point – the point is that the State can’t empower an instrumentality which has this much power and control. There’s no Chinese Wall between the UIDAI and the State. The question is, therefore, how do we approach this architecture and design? After the three experts, the issue is clear. The design of the entire program, architecturally and technologically, is fundamentally flawed. Aadhaar may be technologically brilliant but constitutionally impermissible. Part III rights are too valuable to be sacrificed in this fashion. Manindra Agarwal has spoken about existing laws that protect us. The question however is that are you allowed to set up such an ecology in the first place. This reminds me of the story of the Emperor’s New Clothes. It took a clear-eyed child to discover that the Emperor had no clothes. This ends my rejoinder on surveillance. Now comes to the issue of balancing rights. Like the Rubicon, there are certain rivers which, once you cross, you tip over into a very different situation. Distinguishes Koodankulam case where it was a technology we had tested for 60 years and also had been applied elsewhere. The dangers here are far greater. In terms of impairment to freedom and chilling effect. If the Court agrees that Aadhaar is an engine for surveillance, then there is no question of balancing. The Constitution expressly rejects it. This is not something you take a chance on, or experiment with. Says that these are the two issues the Court has to consider when balancing. And also, what safeguards the Court has to consider when balancing. Shyam Divan responds that this is not a case where a person who wasn’t receiving benefits earlier is receiving benefits now. The government’s case is that there is a saving in welfare benefits. Justice Sikri says that the government’s case is that through those savings, you can then reach people who need it. Justice Chandrachud says that Maastricht Guidelines have said that the issue is not the quantity of food, but access to food. Chief Justice of India says that access to food is a human right. There is a light discussion between Chief Justice of India and Shyam Divan on how Shyam Divan filed returns without Aadhaar. Shyam Divan said he just did it before the deadline so he could. Also points to how Zoheb Hossain also got his Aadhaar only last week. Shyam Divan says that there are two answers. The first is choice and options. Choice and options are part of democracy. They promote inclusion. Please give people a choice in this. The second answer is that yes, you can’t stop technology, but you always have choices in how and which technology to deploy. For example, you can have local databases instead of a centralised one. Comes to his next point, which is on the questions that were put by the Petitioners to the UIDAI. When you’re reading the questions, just put a “Y” for “Yes” next to each question. Our questions were framed in that way, and effectively, every answer is a yes. Points to how they are all yes/no questions he asked and yet long winded answers had been given. Read the questions and responses here. Q1 was to confirm that no UIDAI official verifies at the stage of enrolment. He reads out the answer. Q4 is to confirm that UIDAI takes no responsibility for correct identification of a person. He reads out the answer. The ID number is being issued without verification by UIDAI. They don’t even know whether the documents presented to the enrollers are genuine or false. And they take no responsibility for it. Aadhaar is essentially a self-declaration system of verification. Nobody in government has verified, and they have candidly admitted it. All that UIDAI provides is a marching system – to match at time T what you gave when you enrolled. What you give when you enrolled becomes your universal identity. Says that the government’s claims on using Aadhaar to stop terrorism rings hollow in light of this. Says that this is a deep flaw in how the system works. Our question 3 was that Aadhaar does not identify a person, it only matches. The answer to that yes. Also, UIDAI does not verify age, date of birth etc. That is only derived from the information fed in when enrolled. Our next question was to confirm that the process is probabilistic. We asked for numbers pertaining to rejections. They haven’t answered that specific question. But if one person succeeds once in six times, they count it as a 100% success. Next, we asked them to confirm that biometrics become increasingly unreliable with age. That’s been admitted. We asked them about the 49000 cancellations of operators. They’ve given a generic answer about quality control. We asked them to confirm that at the time of enrolment, there is no verification that the person is not an illegal immigrant. This question was asked because there was a 23.9.2013 order of the Court, specifically stating that Aadhaar should not be given to illegal immigrants. They have said that there is no verification. This is blatant disobedience of the SC order. They were very quick to issue circulars for linking, did they issue any circular on this? We asked to confirm that there is no verification of the 180 day residence requirement. Our next question was whether the machines are equipped to store biometrics. That have admitted it. Then we asked about traceability. Chief Justice of India says that Petitioners must finish by the end of Wednesday. Shyam Divan to continue on Tuesday.